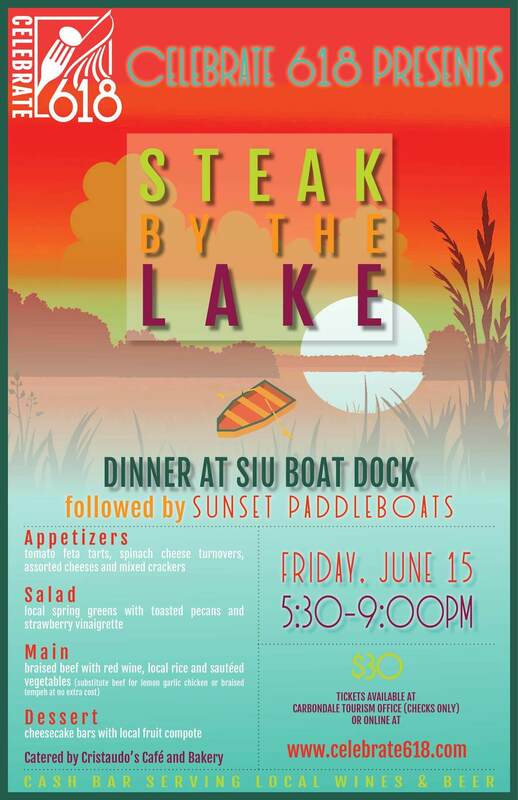 A dinner at SIU Boat Dock, Steak By The Lake, takes place on Friday evening at 5:30pm. Catered by Cristaudo’s Bakery, the menu features your choice of main course; braised beef, lemon garlic chicken, or braised tempeh, alongside local rice and sautéed vegetables. Diners will also get to indulge in an appetizer station, salad course, and dessert. There will be a cash bar serving local wines and beers and an opportunity for sunset paddleboats following dinner. Tickets are $30 and can be purchased online at www.celebrate618.com, through the Celebrate 618 Facebook page or at the Carbondale Tourism office at 126 S. Illinois Avenue (with checks only). Celebrate 618 is a collaborative effort between Carbondale Tourism and several nonprofits to bring Carbondale its very first multiple day summer festival. These collective events would not have been possible without the support of our gracious partners. Thank you! For the latest updates on all things Celebrate 618 follow us on Facebook!